At the end of the year, Kampf Schneid- und Wickeltechnik GmbH Co. KG in Wiehl celebrates a very special milestone: the 1,000th Conslit slitting machine. And here, only the machines have been counted since 1993 – many years before, this type of machine – then known as KS104 or KS 106 – was in international demand. A few days ago, the “Anniversary-Conslit” was successfully tested in the presence of the customer at the Mühlen plant and is shipped to Technofilms in Guatemala. Technofilms S. A., founded in Guatemala in 2000, is part of the Plastilene Group with headquarters in Colombia. For more than a decade, the company has been supplying the Central American market with plastic films for various applications. Technofilms produces films with and without printing of the highest quality for industrial, laminate, agricultural and shrink labels. Here a remarkable circle closes after 1,000 machines. The first machine with the name Conslit was delivered to a customer in Colombia. Since then, the Conslit series has been continuously expanded and improved. The Conslit is a two-spindle machine, which is extremely flexible due to the highly variable Conslit construction kit, which KAMPF customers around the globe appreciate. Conslit is most often used in the printing and packaging industry, especially in high quality productions. A “KAMPF-Conslit” continues to be at the top of the customer’s wish list. The team led by Oliver Conrad, Sales Manager Flexible Packaging at KAMPF, drives the success of the Conslit series together with specialists from the design, assembly, service and technical departments. The steadily growing number of units documents the success of the Conslit machines, which is unique not only for KAMPF, but also in the entire market for slitting and winding machines. Reason enough for the KAMPF management to invite to a celebration at the Conslit assembly island in Mühlen on December 18th and to say “Thank you! Stefano Pacini, CEO of Plastilene had travelled from Colombia especially to celebrate the 1,000th Conslit with the employees from Mühlen and Dohr/Eifel, who have worked on the success of the Conslit in the last years. In his speech, Lutz Busch, CEO of KAMPF, summarized the milestones in the history of Conslit. After the official part of the event the guests exchanged some anecdotes about one or the other very special Conslit. Now we are counting to 2,000. 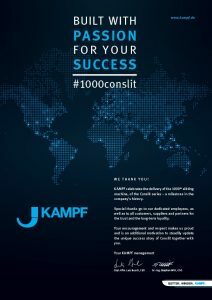 KAMPF celebrates the delivery of the 1000th slitting machine, of the Conslit series — a milestone in the company’s history. Special thanks go to our dedicated employees, as well as to all customers, suppliers and partners for the trust and the long-term loyality. Your encouragement and respect makes us proud and is an additional motivation to steadily update the unique success story of Conslit together with you. On December 18, 2017 we celebrate with our customer TechnoFilms S. A. from Amatitlan in Guatemala to deliver the 1,000th Conslit. We are happy – and a little proud. 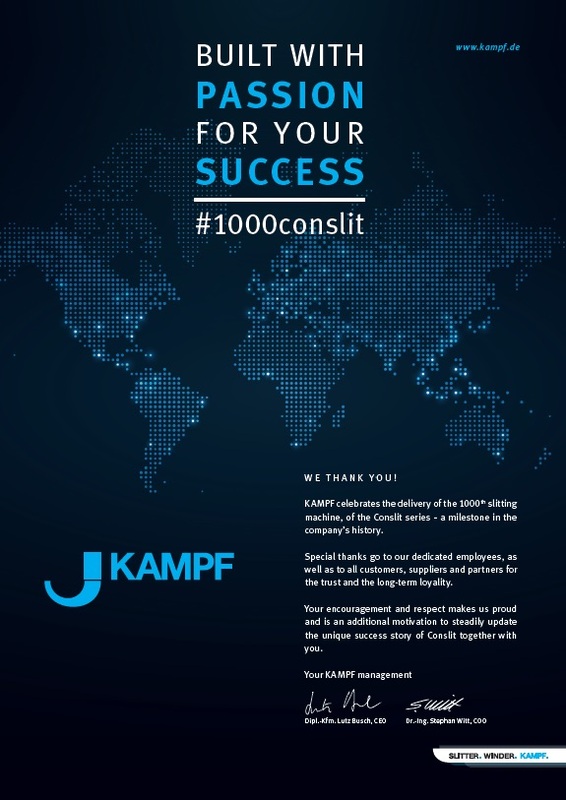 The successful history of Conslit has not only been written by KAMPF since 1993 alone, but together with our hundreds of customers. This was reason enough that in the presence of TechnoFilms S. A. a small ceremony takes place.